According to research done by the Club around 170,000 scooters were built by the Heinkel company between 1953 and 1964. All the scooters were built at Heinkel’s Karlsruhe factory in Germany which was specifically set up for the purpose. Engines were supplied from Heinkel’s existing Speyer factory. There was no know overseas production or assembly despite the scooters selling well in many overseas markets. The scooters were well received by the road testers of the time and were successful in many European countries, where large numbers are still in use today. The ‘Tourist’ was for many years the largest selling scooter in Germany. In this country the premium price meant that they were never a big seller, appealing to the more affluent rider, who wanted a machine for leisure use rather than just a cheap means of transport to and from work. Heinkel scooters achieved many successes in Sports Meetings and Endurance Trials in the late 1950s and early 1960s which did much to enhance their reputation as “The Rolls Royce of Scooters”. A 1964 brochure claimed 3,000 million miles had been covered in the previous ten years by Heinkel riders! That’s an average of around 25,000 per machine! Many went on to cover exceptionally high mileages, many owners achieving more than 100,000 miles with only routine servicing. The scooters do not seem to have suffered from big end failure to which the cars are prone. The majority of Heinkel scooters were ‘Tourists’. Attempts at a light weight commuter machine were less successful. Below is a summary of models and estimates of the numbers produced. The first prototype scooter was built in 1949 but production was not announced until January 1953, just before the Brussels Motor Cycle Show. Production started in April of that year, at a newly established factory in Karlsruhe, with the first buyers taking delivery towards the end of 1953. The scooters design owed much to Heinkel’s aircraft building experience. A tubular steel frame was enclosed by sheet metal pressings. The front suspension was by telescopic forks and the rear by hydraulically damped swinging arm attached to the crankcase. The power unit was a 149cc, (59mm x 54.5mm) overhead valve, single cylinder engine which produced 7.2 bhp at 5,200 rpm. A three speed gearbox was incorporated in the crankcase and operated by a twist grip. The final drive was by fully enclosed chain running in oil A top speed of 56 mph was claimed and the aerodynamic styling enabled fuel economy of up to 137 mpg. The Tourist was designed as a luxury machine from the start, the front apron not only improved aerodynamics and therefore fuel economy but also gave maximum protection to the rider from the elements. It was also well equipped coming complete with steering lock, speedo, clock, spare wheel and carrier. 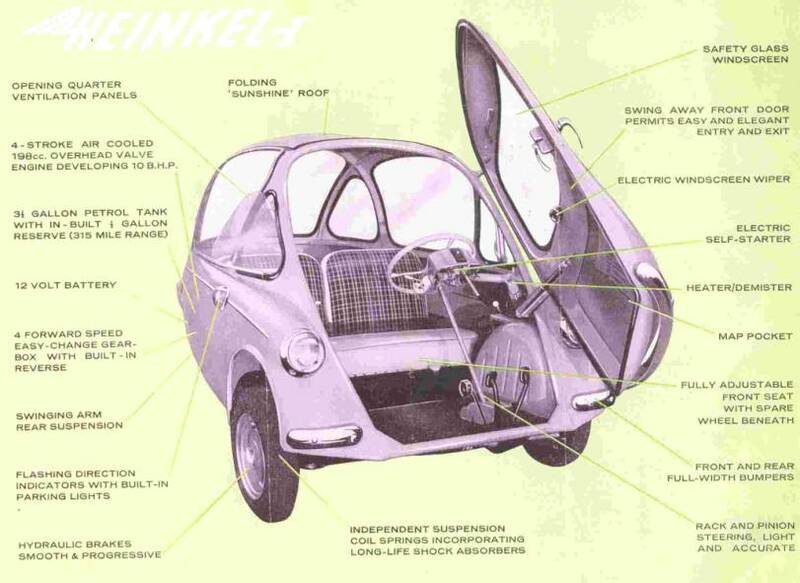 While never the cheapest of machines it’s low running costs and the reputation of Heinkel’s engineering ensured that it was a success with the increasingly affluent Germans. Early versions had 6 volt electric’s, which were updated to 12 volts in June 1954 when an electric starter was added. In August 1954 the model was superseded by the 102 A1. The main change on the new, 102 A1, was the increase in engine size to 175cc (60mm x 61.5mm), this increased power output to 9.2 bhp at 5,200rpm. It made little difference to top speed, as the gearing remained the same, but the additional power improved performance when carrying a passenger or luggage. The carburettor was also changed from a Pallas 18/10 to a Bing 1/18/5 model. The visual appearance changed little and the three speed transmission was retained. The reputation for reliability which the Tourist developed not only helped sales at home but allowed the firm to establish export markets in many parts of the world. The revised model kept the 175cc engine but now had a four speed gearbox. The carburettor reverted back to the Pallas unit and the wheels were increased from eight to ten inch, running on 400 profile tyres. This model can be identified by the bicycle style handlebars with the instruments set in the top of the front canopy. A Siba 12v 90w dynastart was fitted to provide electric starting and lighting. The 103 A-0 was the first model to be officially imported into the UK in late 1955. 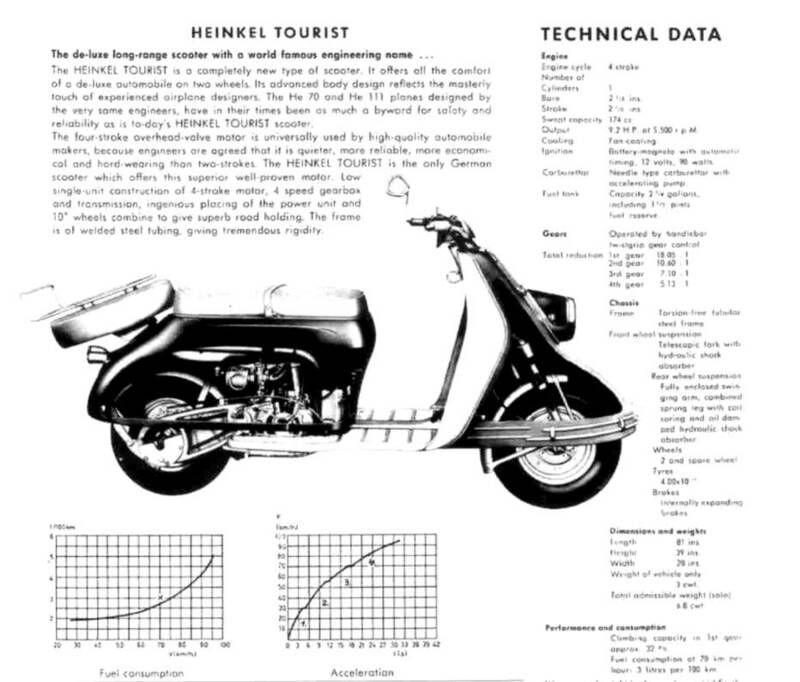 The first road test of the ‘Excelsior Heinkel Tourist’ was published by Motor Cycling on 27 October 1955. It was priced at £239-8-0d including purchase tax. A clock at £2-8-0d and spare wheel with carrier at £13-4-0d were extras, initially it was only available in beige. The relatively high price in this country prevented it becoming the success it was at home and in some other export markets. Heinkel’s association with Excelsior did not last long. The concession was taken over by Nobel Motors Ltd of Piccadilly, London, probably as part of the deal when they started importing the cars in late 1956. 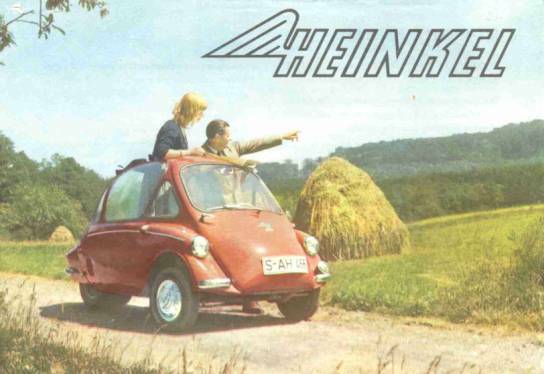 A sales brochure from this time features all three Heinkel vehicles together, the Perle moped, the Tourist 103 A0 and the 174cc Cabin Cruiser. In October 1957 the price of the Tourist had dropped to £229 10s 0d, but this was still high when compared with the 150cc LDB Lambretta at £164 15s 2d or the 145cc GS Vespa at £188 12s 8d. For the minimal motorist of 1957 the standard Bond Minicar was available for £50 more than the Tourist at £279 5s 9d. while the Heinkel Cabin Cruiser was £100 more than the Bond at £379 15s 0d. Chassis From 140001 to ?? Engine From 435001 to ?? The production estimate of 34,060 may be a little high as the chassis numbers for the 103 A1 are supposed to start at 170001, a range of only 30,000. There are four low chassis numbers on the Club Register but it is not known if any of these are ‘Excelsior’ badged. The styling of this model was virtually unchanged except for the introduction of a cast handlebar incorporating the instrument panel. The engine was revised, it now featured a two bearing crankshaft and Bosch dynastart, similar to the 198cc engine used in the cars. The most significant improvement to rider comfort and noise suppression was the introduction of rubber engine mountings. At about the time of the introduction of the new model International Sales of Dublin became the UK concessionaires. This was no doubt part of the deal between Heinkel and the Irish government when car production was transferred to Dundalk. The Heinkel ‘Tourist’ also began making a name for itself at Sports Meetings and Endurance Trials gaining many awards, as their brochures were keen to point out to prospective buyers. Chassis From 170001 to ?? Engine From 520001 to ?? Chassis From 225001 to ?? Engine From 570063 to ?? 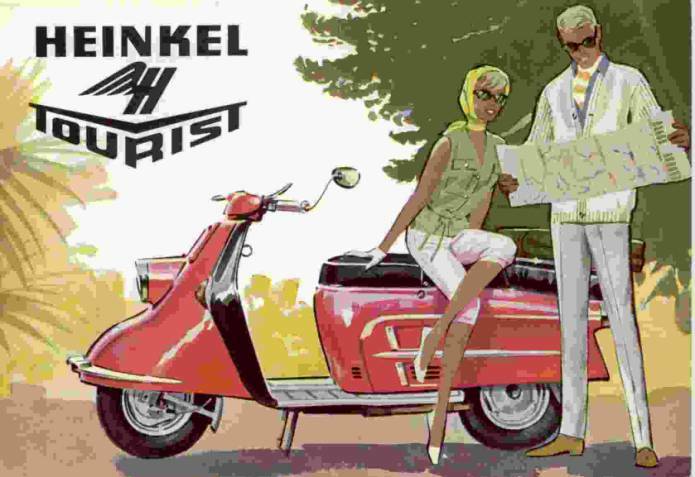 The ‘Tourist’ was succeeding at the top end of the scooter market but Heinkel wanted a lighter machine to appeal to female riders, be more suitable for city commuting and compete against the two-stroke machines from Italy. The first attempt, a 125cc four-stroke known as the 112, was shown at the 1956 Frankfurt Motor Cycle Show. The engine produced 6.25 bhp and with a weight of only 105 kgs provided lively performance and a claimed 51 mph top speed. While being light weight it was also a large machine fitted with 12 inch wheels. Only five prototypes were made and it never went into production. Despite this the UK concessionaires, Noble Motors Ltd, had embarked on a marketing campaign for the proposed scooter. 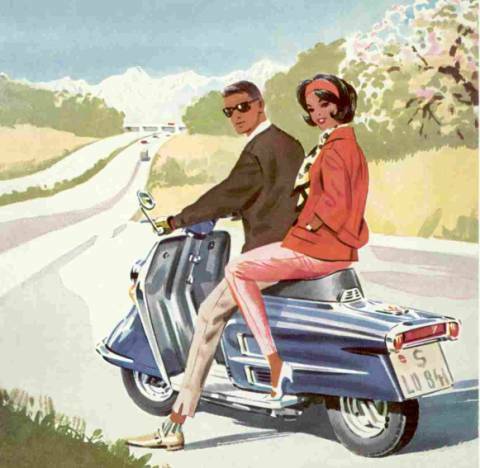 Brochures were produced, claiming among other things that it was the first scooter to be fitted with tubeless tyres. The model was still appearing in contemporary price lists in October 1957 as the 125cc ‘Continental o.h.v.’ at £197 15s. 0d. around £30 less than the ‘Tourist’ but still £30 more than the 125cc Lambretta. The next attempt at a light weight scooter was the 150, this was also the last vehicle to be designed and produced by Heinkel. In contrast to the other scooters it employed a vertical single cylinder, piston ported, 2-stroke engine of 150cc (57mm x 58.8mm). It had an alloy barrel with hard chrome lining, a compression ratio of 10:1 and produced 9.5 bhp at 5,700 rpm. A three speed twist grip controlled gearbox was incorporated in the crankcase. With power almost the same as the ‘Tourist’ and a weight of only 118 kgs against 156 kg it was an excellent performer. The styling was similar to the ‘Tourist’ at the rear but more like the Italian opposition at the front. Electric start and fan cooling followed the ‘Tourist’ tradition. No kick start was provided. The price in early 1963 was £199 18s 3p with the carrier costing an extra £5 7s-3d. This compared with a top of the range Lambretta at £183. However, by 1962 scooter sales were in decline and dealers had resorted to discounting to clear stocks. Lambrettas were being advertised with discounts of up to £40. Not an opportune time to launch a new scooter in the UK. The concessionaire was Hans Motors who, according to a former employee, imported them in batches of five, and it is unlikely that more than fifty were imported. Chassis From 700001 to ?? Engine From 200001 to ? ?